Font Awesome by Dave Gandy is “the iconic font” designed for use with Twitter Bootstrap. But guess what? You don’t have to use Twitter Bootstrap. Font Awesome can be used with any site or framework. Beyond the 249 icons, my favorite thing about Font Awesome is how designer friendly it is. Just install FontAwesome.otf and visit the copy and paste page when designing. 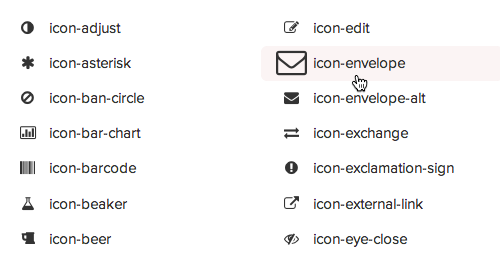 You can also contribute your own icons. Although to submit your icon, you’ll need to email Dave at dave@davegandy.com so he can approve your icon for submission vs sending a pull request. He’s keeping a very tight reign on quality. Font Awesome’s licensing is a combination of the SIL open font license, MIT license for code, and the CC 3.0 license - making it completely free for commercial use. Attribution is no longer required for Font Awesome 3.0, but it is much appreciated. Check out the source on GitHub and the integration details to get started. UPDATE: Use icnfnt (The official subsetting tool of Font Awesome) to create a custom Font Awesome icon-font kit with only the icons you want. It even includes the CSS, Sass, SCSS, & LESS files. While you’re at it, check out the source for icnfnt as well.